to create a very unique doorknob set. Or send us two of your stones and we will attach them for you on our hardware. overstock 60mm or Egg stones on this site. Online ordering not available. Contact us directly to make arrangements to purchase. and we will attach them to the hardware. 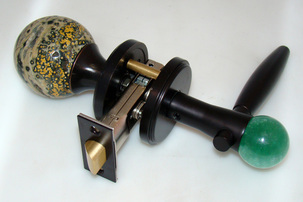 Your cost would be $75 for the hardware & attachment plus $30 for the 2 spheres. 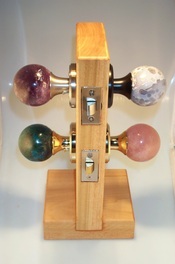 Choose different stones/finishes/styles on either side of doorknob. Pricing dependent on stone selection. ensure you get the combination you want.